If you are completely new to mushroom growing, I recommend that you skim through a copy of Growing Gourmet and Medicinal Mushrooms by Paul Stamets. Many libraries have the 2nd Edition, or you can order the expanded 3rd Edition through my link to Amazon.com (click on the title). Paul's book will give you a good overview of growing mushrooms of all kinds. It has plenty of pictures, and there are descriptions of most of the mushroom species that can be reliably cultivated. It is also a valuable reference volume, and I use it regularly. (Paul's earlier book with J.S. Chilton, The Mushroom Cultivator, is also a good overview, focusing more on Agaricus and other compost-grown species.) Don't be put off by all the talk about contamination and sterile procedure, though--that's where the peroxide method comes in! 1) Acquiring and maintaining a culture of mushroom tissue (called mycelium) of the mushroom strain you want. (A tissue culture is somewhat like a cutting of a plant. Starting with a tissue culture assures that you have a mushroom strain genetically identical to the one you want. Some growers start with spores, which are more like seeds. Spores may or may not give you a mushroom strain with the fruiting properties of the parent. Since spores cannot be grown in the presence of hydrogen peroxide, I always work with a tissue culture of mycelium. Tissue cultures--also called agar cultures or test tube cultures--of various species of mushroom can be purchased from commercial suppliers or they can be started from fresh mushrooms). 2) Using a bit of the tissue culture to begin some spawn (a kind of mushroom starter), which is usually grown on a small quantity of sterilized grain or sawdust. 3) Using the spawn to introduce mushroom mycelium into an organic material (substrate) chosen to support the formation of mushrooms. 4) Getting the actual mushrooms to form and grow once the substrate has been completely colonized by mushroom mycelium. If you buy a mushroom kit, you are generally starting at step four. The commercial mushroom grower has already completed the earlier steps for you, and provided you with the mushroom culture ready to form mushrooms. You provide a proper environment, usually cool and moist. Getting mushrooms to form can be easy or hard, depending on the mushroom strain you are growing. Oyster-style mushrooms of the Pleurotus and Hypsizygus families are among the easiest to fruit. 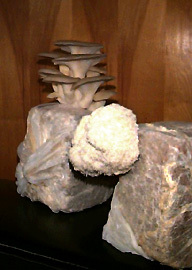 Lions Mane (Hericium erinaceus) is also quite easy. Maitake (Grifola frondosa) and Morels (Morachella species) are among the most difficult to get to form mushrooms. Shiitake (Lentinula edodes) falls somewhere in the middle. Button mushrooms are easy if you can keep the temperature steady around 65 degrees F.
It is also possible to start at step three, by purchasing the "starter" (spawn) from a supplier and using that to introduce the growing fungus into an organic material that you have prepared yourself. There are a variety of possible substrates: straw, compost, logs, wood chips, and sawdust are common ones, but people have also used things like newspaper, cardboard, sterilized grain, coffee grounds, etc. depending on the mushroom species they want to grow. In general, there are two broad classes of cultivated mushrooms: those that prefer to grow on compost, and those that prefer to grow on woody material. The common button mushroom and other Agaricus species fall into the first class, growing readily on compost, but they will also grow on straw. Oyster mushrooms, shiitake, reishi, maitake, and Lions Mane, all prefer woody materials such as sawdust, wood chips, or sometimes straw. Each organic material requires a different procedure to render it free of competing organisms. Compost is the most time-consuming material to prepare, requiring a couple of weeks to mature. It needs to be allowed to heat to a temperature that neutralizes harmful species, without letting it get so hot that it kills beneficial microbes. The compost is not allowed to go completely through its natural cycle. Instead it is harvested somewhat early, when it is full of white actinomycetes bacteria that provide the nutrients that mushrooms love. The grower cools the compost, adds some gypsum (calcium sulfate) and mixes in the mushroom spawn. Woody materials and straw can be prepared much more quickly than compost. Traditionally, these materials required a heat treatment, such as pressure sterilization, steam pasteurization, or hot water steeping, to eliminate competing organisms. The peroxide method has now added ways to prepare some substrates without heating. It can also prevent later contamination by airborne molds and bacteria, so using a material that is compatible with hydrogen peroxide addition can save a lot of trouble. For wood-decomposing mushrooms, wood pellet fuel, which disintegrates into sawdust when treated with boiling water, works very well in this regard, and so does wheat straw. The compost-loving species require a different procedure from the wood-loving mushrooms when it comes time to get the mushrooms to form. The compost-lovers usually need to have a soil-like layer called "casing," applied to the top of the culture, once the mushroom tissue has fully colonized the compost. The soil-like layer provides a reservoir of moisture, and it creates a low-nutrient zone (compared to the compost), signaling the mushroom tissue to start forming the fruiting bodies. The tiny mushroom buttons then begin to form in the casing layer. The grower keeps the casing moist by lightly watering it as the mushrooms enlarge. With wood-loving species, the procedure for getting mushrooms to form varies a bit from one species to another, but it usually involves a shift in environmental conditions such as a drop in temperature, an increase in air circulation, and/or an increase in light levels. Once you have tried growing mushrooms from a kit and from spawn you've purchased, you will have a better idea whether you want to get involved in keeping agar cultures and growing your own spawn. These procedures require somewhat more commitment and attention to detail. Before the invention of the peroxide technique, it was generally only possible to keep agar cultures and grow spawn if you constructed a sterile work space, such as a glove box at the very least. With peroxide, it becomes possible to perform these steps in an ordinary kitchen, and grow the cultures just about anywhere that an appropriate temperature and light level can be provided. You still need to learn some basic "sterile technique"--simple procedures for handling cultures to keep them pure. But you won't need a sterile facility or a spotless house. The Mushroom Cultivator: A Practical Guide to Growing Mushrooms at Home, by Paul Stamets and J.S. Chilton, also offered in association with Amazon.com. This document is Copyright: ©1999 by Randall R. Wayne, Ph.D. All commercial rights are reserved. No part of this work may be reproduced or used for sale in any form or by any means without permission of the author.